Enjoy the museums and other features of Romulus. This city is cosmopolitan and welcoming, recognized for its restaurants, shopping and sporting events. Henry Ford Museum and Motown Historical Museum are just a couple of the must-sees in the area. A vacation rental can help make your stay complete—many rentals come with a full kitchen and laundry facilities. Fly into Detroit, MI (DTW-Detroit Metropolitan Wayne County), the closest airport, located 0.9 mi (1.4 km) from the city center. If you can't find a flight that works for your travel itinerary, you might consider flying into Ann Arbor, MI (ARB-Ann Arbor Municipal), which is 20 mi (32.2 km) away. Where to stay around Romulus? 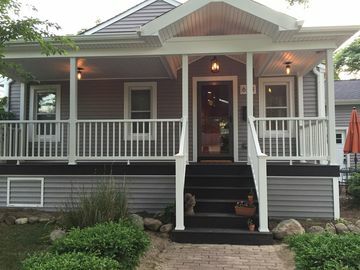 Our 2019 property listings offer a large selection of 35 vacation rentals near Romulus. From 26 Houses to 6 Condos/Apartments, find a unique house rental for you to enjoy a memorable stay with your family and friends. The best places to stay near Romulus for a holiday or a weekend are on HomeAway. What is the best area to stay when traveling to Romulus? Can I rent Houses in Romulus? Can I find a vacation rental with pool in Romulus? Yes, you can select your preferred vacation rental with pool among our 3 vacation rentals with pool available in Romulus. Please use our search bar to access the selection of vacation rentals available.